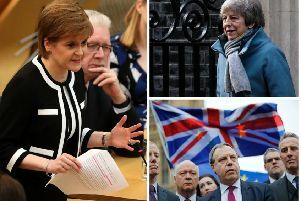 The Conservatives last night warned a hard border between Scotland and England would result from Scottish Government plans for a separate Norway-style deal with the EU. The warning came after the BBC reported that ministers are exploring a proposal for Scotland to join the European Economic Area (EEA) as the rest of the UK leaves the EU. Membership of the EEA gives Norway, Iceland and Liechtenstein access to the single market and is part of free movement in return for a payment to the EU. The EEA is not, however, part of the customs union which means it can set tariffs, which in turn could lead to an economic barrier at the England-Scotland border. Meanwhile, last night the Scottish Government failed to win the support of all of Holyrood as it called for Scotland’s place in the single market to be “fully protected”. MSPs passed a motion from ministers on Scotland’s place in the single market by 65 votes to 32, with 20 abstentions, with the Tories and the Liberal Democrats voting against the government. Labour abstained, claiming the wording of the motion was slanted towards Scottish independence.